Our dental office has been serving the Assonet and Freetown communities for more than 35 years. 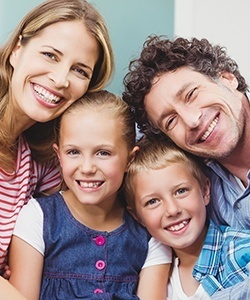 We take a conservative, proactive, patient-centered approach to dental care. Instead of just fixing problems as they pop up (which we can certainly do! 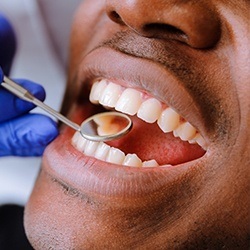 ), we also provide a number of preventive dentistry services designed to stop tooth decay and gum disease before they even start. If you’re ready to have the kind of problem-free smile that never needs a second thought, call us today to schedule an appointment. Why Choose Woodside Dental Care for Preventive Dentistry? Most oral health problems don’t show any obvious signs right away, leading many issues to go unnoticed until the problem is already advanced. At this point, a patient is usually in quite a bit of pain, and their issue can’t be easily and inexpensively treated. To save patients from this kind of headache, we recommend that everyone receive at least two checkups and cleanings each year. These appointments enable Dr. Cornetta to catch and treat any cavities or damage as early as possible, saving a patient from needing more extensive and expensive treatments in the future. This is also when patients get a cleaning from one of our hygienists, which can remove harmful plaque and tartar from those areas in the mouth your brush and floss can’t reach at home. They can also break up minor surface stains to keep your teeth nice and white! 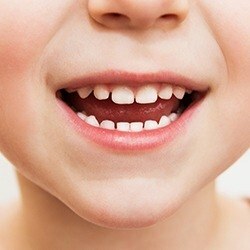 The teeth come in many different shapes and sizes, and the back teeth, with their wide and grooved surfaces, are by far the most vulnerable to developing cavities, especially for young children who are still learning to brush. Their deep grooves are the perfect traps for food particles and plaque, but we can keep these teeth fully protected with a dental sealant. We’ll apply a clear, filling-like material to the teeth, and it will quickly harden into an invisible barrier that plaque, bacteria, and acids cannot cross. About 1 in 3 Americans unconsciously grind their teeth while they sleep, and this is something dentists refer to as bruxism. This exposes the teeth to forces much greater than typical biting and chewing, which can wear them down and eventually cause them to break. 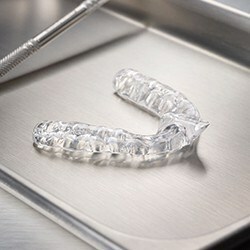 To help patients rest easy, we can provide them with a small oral appliance called a nightguard. Worn only to bed, it places a thin but firm barrier between the rows of teeth to prevent them from coming together. Oral cancer can be very easy to miss during its early stages, leading many patients to not be diagnosed until the disease is quite advanced and difficult to treat. To make sure our patients are never caught off guard, we perform an oral cancer screening at every appointment. Our trained eyes will be on the lookout for any suspicious spots or growths in or around your mouth, and if we find anything, we can help you get follow-up care immediately. Fluoride is a mineral that is often added to toothpaste and community water sources because, when exposed to the teeth, it actually helps strengthen the enamel and lower a person’s risk of developing tooth decay. To give our patients another weapon in the fight against cavities, we can provide a topical fluoride treatment during their regular checkups. It only takes a minute, is completely painless, and it’s one of the best ways to keep smiles of all ages healthy between appointments. Our practice has been around so long that many of our child patients are starting to bring their own children to come see us! We just love having little ones around the office, and we have all the services growing smiles need to stay cavity-free year after year. Our team will go out of their way to ensure your child’s comfort from check-in to checkout so no one ever has to dread going to the dentist! When it comes to your oral health, the condition of your gums is just as important as your teeth. Without consistent oral hygiene, the gums can easily develop an infection called periodontal disease, better known as gum disease. Symptoms include red, swollen, and tender gums that bleed easily. Without treatment, gum disease can actually cause bone loss, eventually leading to tooth loss. Gum disease is actually the leading cause of adult tooth loss in the US! At Woodside Dental Care, our team is ready to protect your entire mouth, so we’ll screen your gums whenever you come to see us. If we spot any signs of infection, we can use a deep cleaning called scaling and root planing to remove bacteria and lower your risk of reinfection at the same time. To help your gums heal, we can apply a topical antibiotic as well. We’ll make sure your smile stays healthy from top to bottom! Do you think that you have sleep apnea, or have you already been diagnosed with the condition? If so, then the sleep solution you need might be at a place you don’t expect: Woodside Dental Care! We can use a custom-made oral appliance to help patients get the deep, restful sleep they need to feel energized during the day, and they can even be used to stop snoring! This method is proven effective, and it can even serve as a viable alternative for patients who want to get rid of their CPAP. 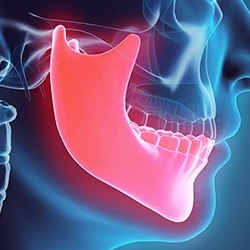 Your TMJ (temporomandibular joint) is the joint that connects your lower jaw to your skull, giving you the ability to eat, speak, laugh and yawn. It can sometimes develop dysfunction due to strain, injury, or inflammation, leading to symptoms like a stiff and painful jaw, chronic headaches, and soreness in the neck and shoulders. Using precise testing and targeted therapies, our team can determine the root cause of a patient’s pain and provide the long-term relief they need.